Basseterre, St. Kitts, August 26, 2016 (SKNIS): St. Kitts and Nevis’ National and International track and field sprint icon Kim Collins has been congratulated on Kim Collins Day, which was celebrated in the Federation on August 25. In a congratulatory message to Mr. Collins, Deputy Prime Minister and Minister of Youth and Sports et al, the Honourable Shawn Richards, reflected on the track and field star’s achievements. “I want to use this opportunity today, Kim Collins Day, August 25th, to say congratulations and well done to Kim Collins and all the other potential little Kim Collins in our society,” Deputy Prime Minister Richards said. Kim Collins has several track and field accomplishments including gold in the 100 meters and 200 meters at the Central American and Caribbean Games (CAC) in 2001 in Guatemala City; in 2002, he won gold in the 100 meters at the Commonwealth Games in Manchester, England; he won gold in the 100 meters at the World Championships in 2003 in Paris, France; and gold again in the 100 meters at the CAC Games in St. George’s, Grenada. On April 5, 2015, during the 44th CARIFTA Games in St. Kitts, the Silver Jubilee Stadium in Bird Rock was renamed the Kim Collins Athletic Stadium in honour of Mr. Collins’ achievements. The name changing ceremony was attended by several high ranking official of the Government, diplomatic corps and civil society, including St. Kitts and Nevis’ first Prime Minister now National Hero, the Right Hon. Dr. Sir Kennedy Alphonse Simmonds. “Kim Collins exemplifies the talented and driven nature of our people. He exudes the tremendous will to succeed that characterised our ancestors. Twenty years at the top of any activity, much less a gruelling sport like world athletics where the career span is often less than 10 years, is phenomenal,” Deputy Prime Minister Richards pointed out at the ceremony. “Kim has persevered and broken all physical and social barriers that may have been placed for athletes and more significantly, Caribbean athletes. No more can the world of athletics declare that a 38-year-old sprinter cannot beat the world,” Honourable Richards added. 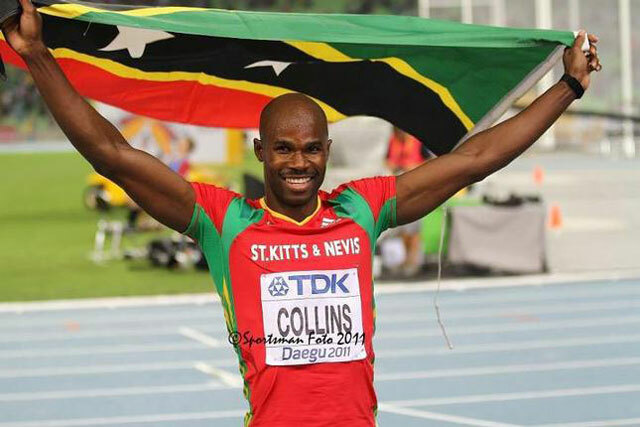 “When I became world champion, people did not understand we did not have a surface here in St Kitts and Nevis, but that did not stop me,” said Collins, while thanking the Government of Prime Minister Timothy Harris.